You’re going to love these videos! I found some really nice videos this week that I’d like to share… They are each different, and are quite unique in their own way. This is a beautifully produced video, which is full on insightful, less well known information. And a pleasure to watch! Have you considered the role of Rhythm in your life? Well known, much loved, and many many times watched, Foli is an beautiful work of art that makes us stop and consider some of the most basic principles of life, music and rhythm. In today’s world climate of fear, and division, it was a really nice surprise to find this video from what looks to have been a very interesting conference about using culture as a measn of social, racial integration in Portugal…. very interesting work and some interesting names of thought leaders popped up for me to research further such as Amilcar Cabral… did I mention there’s also an interview with Babara Bangoura and a real nice djembekan! Then there’s just the good old fasioned, amazing djembekan video…. There are surely other amazing djembe videos out there, just waiting to be discovered. What did we miss? What are your favourites? Author JamesPosted on November 20, 2015 November 20, 2015 Categories Djembe VideosLeave a comment on You’re going to love these videos! It can be difficult to find the opportunity, to meet and learn from the world’s greatest djembefola’s. For those who don’t have the chance, we tried for the next best thing. 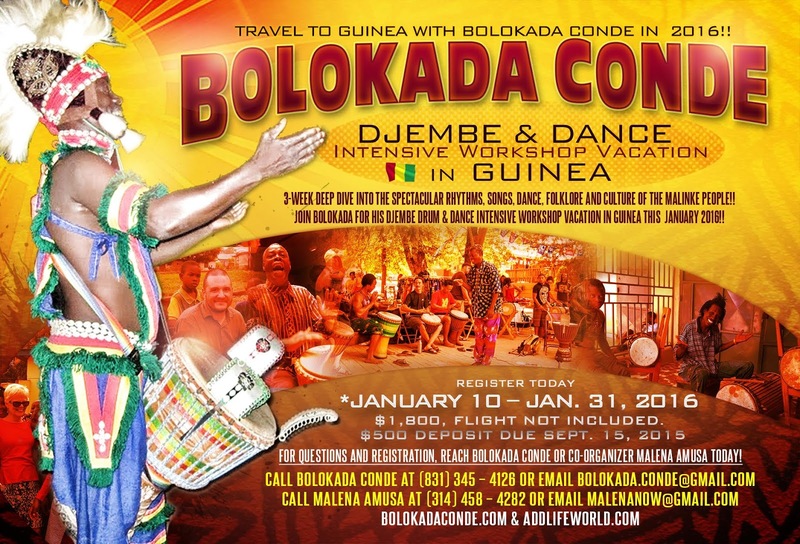 We interviewed one of the greatest djembefolas to have lived, Bolokada Conde, and he reveals some interesting information about how he learn’t to play, and how he came to travel the world with Les Percussions de Guinée. Subscribe to our channel to get all of our videos first! Would you love to play as great a djembe as possible? The quality of your djembe has a BIG impact on the percieved quality of your playing. Sure it’s possible to get good sounds out of nearly any djembe, but when you are playing with other people it can be hard to be heard if you can’t project your music easily. If you have to exert yourself too much you get tired faster, and you can injure yourself trying to squeeze more volume out of the drum. Each djembe has it’s own unique sound that comes from the combination of the wood, the carving inside the bowl, the skin, and how the skin is mounted. As such there are many things to consider when buying a djembe, and without a doubt the wood that the djembe is made from is probably one of the most important considerations. I am happy to introduce Awa djembes, which are the line of djembes that grand master Mamady Keita chose to carry his name in his limited edition 40 piece djembe line (which is now sold out). The premium Awa djembe range is made by the same people, and the quality of these djembes is guaranteed by such projects that have gone before, and the years of experience that Jeremy Tomasck has in djembe construction. We have you covered with a guarantee of quality in line with the articles linked to above that spell out what you should be looking for in a djembe that will last you a life time. Don’t miss these introductory prices, upgrade your playing with a djembe you can be sure you will love for a very long time. If you would like to support djembefola.com, and know someone else who would be interested in seeing this email, please do forward it to a friend or like it on Facebook. We’ve been online since 2008, so we have a lot of great information and learning resources to help you learn more about this music, culture, and become a better drummer. It can however be difficult for people who have just found us to find all the good content that has passed before, so I hope to highlight some of our best content here. The most recent was with Master djembefola Bolokada Conde. Don’t miss this hour and half long lecture from Mamady Keita, this interview with M’Bembe Bangoura, and these other interviews. It’s important to know about the great djembefolas who have come before, so that you know the history of the instrument and can track down quality videos, workshops, and learning material. We have an artists section, where we have biographies on some of the best drummers and dancers past and present. We also have a powerful djembe notation system, that allows anyone to easily make their own djembe or dundun notation, that can be edited later, emailed or shared on social, media with friends or other people in the forum. The idea is to make it easy for us to share, discuss and learn from each other. Notation that is marked as ‘public’ (for public consumption – your notation can also be private), appear on the public drum notation page. We recently also developed a notation player for the system that will actually play the notation (this currently only works on the Google Chrome web browser, and currently only for djembe drums), you can see an example of this in action, if you click play on this page. So if you want to explain or share something with someone you can simply create it on the notation system, and email someone a link to the phrase, where they can read it, or even listen to it with the player. Otherwise you can just enjoy the drum notation that other people have already shared. There is also a djembe rhythms section that has a huge list of traditional and modern drum rhythms. There is always new content being added there, as it connects with drum notation system and automatically pulls in any notation that someone has added (and marked as public), along with descriptions and videos we have added. It also pulls in links to any mentions this rhythm gets in the djembe forum. The page for Soko, is currently the most developed, and we are building this out over time so expect this to grow. Djembefola.com, is the biggest English language djembe forum online, and we have many years of sharing from our awesome community from which you can benefit. You can also create your own djembe blog, where you instantly have an interested audience, or if writing isn’t your thing you can enjoy reading about other drummer’s experiences. Connect with other drummers on the djembefola djembe forum, share and learn with other people who have the same passion, and even bring these relationships into the real world, as many of us have already done. We have gone into quite a few rhythms in deeper detail with our Rhythm of the month section in the forum, this part of the site requires you to login, or register if you haven’t already got a free djembefola.com account, and some of the conversations we have had pull on the unique experiences of many experienced students of the djembe. For most of the larger international djembe communities we have a ‘countries page’, where you’ll find local information about what’s happening in your community. Any djembe related events that you are organising can be added to our events section (events can be added here) and they then appear on the related international page. To see if we have a page for your country, check out the international djembe page. Any events added to djembefola.com are automatically posted into the forum for discussion, and anyone who has subscribed for that country is emailed the details of the event. More information about adding events to djembefola.com. Both experienced drummers and beginners will find the djembefola glossary useful, as it explains some terminology that is used both in the djembe forum, and our articles. If you are considering buying a djembe, then be sure to check out our guide to buying a djembe, and this article about the different kinds of woods used to make djembes. At some point, you may consider going to Africa to study drum or dance and in this case, have a look at this article, which explores the various option when studying in Africa. We have several articles that aim to help you play better djembe. If you want to improve and understand djembe culture and music, they we really recommend learning more about the culture and context in which it’s played. We have articles on the role of traditional djembe drumming, traditional west african djembe music dancing, and the art of Jeliya. We also have an instructional article on how to make your own dundun stands. In addition to the articles above, we provide a few options when it comes to learning drumming here on djembefola.com. We have some free djembe lessons available. We also partnered with Tasumakan a few years ago, to bring you top notch djembe instructional videos, that are available to download instantly. It’s been a great 7 years so far, and we plan to keep bringing you the highest quality djembe related news, articles, lessons and resources, so if you haven’t already done so, be sure to signup to our newsletter to get our latest content first. In 2009 the Big bang festival brought legendary master djembefola Mamady Keita to Dublin to teach, perform and share his unique knowledge of the djembe. Djembefola.com, was given permission to record and present a recording of this one and a half hour lecture, and interview with Big Bang organiser Brian Flemming, in which he talks about the origins of the djembe, djembe culture, and the place of the djembe in the modern world. This is one of the most informative, intimate sessions with Mamady that you will find online. Why you only need one hand to play djembe! This is a great example how beautiful simplicity can be by living legend grand master Mamady Keita. The video is notated and put together is this great way by Louis Cesar Ewande, who has a great collection of djembe videos which are really well put together, and worth checking out. Sadly Boka Camara passed away in 2009, but he is certainly not forgotten and it’s always a pleasure when new footage of his amazing chops show up again… Here’s a new upload by Tasumakan footage of Boka as he joins the local crew at a Dununba celebration in the neighborhood of Dixin in Conakry in West Africa in 2005. Koungbana Conde has been drumming since the 50/60’s. He was in ballet Djoliba for 20 years and was a founding member and artistic director of ‘les percussions de guinea’. This video is another Louis Cesar Ewande remix / creation, and the solo Koungbana give us is beautiful, and is full of interesting ideas. Here’s an awesome documentary about Circus Baobab which gives a real insight into the hard work it takes to be a part of a ballet or circus in Guinea. It tells the story of the the first African acrobatic circus being created in Conakry. Some artists came from African Ballets, others came from the streets. In March of 2000 the circus is ready to travel around the country, and this documentary covers their trials, tribulations, joys and sorrows as a travelling circus. A must watch for lovers of African drum, dance and circus. Ban on music in Mali, home of the djembe, the blues, the banjo and so much more! Imagine music being outlawed in one of the most musically rich countries in Africa. Sadly this is exactly what has happened in some parts of the North of Mali. Last week the Malian government signed a UN sponsored deal with armed rebels in the north of the country, but despite the agreement’s intention to “create a climate and state of mind on the ground that would help further negotiations leading to a global peace agreement.”, it’s unlikely to improve the freedoms of people on the ground and certainly not to express themselves musically. 40 UN peace keepers have been killed in Mali since July 2014, most of them since peace talks started. It seems that the situation in Mali is improving and a long way off the French military intervention of 2013, which stopped the rebels advancing on the capital of Bamako. With sad tales of instruments can being destroyed, bans on singing, and the demise of the much loved Festival of the Desert (whose demise is documented in the recently released ‘The last song before the war‘), it may be a long time before we can expect much musical magic from the north. This agreement does not include Al-Qaeda linked groups, so it doesn’t seem likely that the risk of kidnappings or resulting fear of kidnapping will improve as a result of it. The impact of this state of affairs on tourism in Mali, have been devastating. Many of us travel to Mali to study drum and dance, and although I can neither recommend nor not recommend doing so, some Westerners living there do claim that sectors of Mali are safe. Most international organisations have resumed operations there, but are advised by the US department of state to exercise caution and take various security precautions. The US embassy in Bamako maintains security alerts, and recommends avoiding public gatherings, and varying your regular routes of travel. Mali is an amazing country to visit, I was there shortly after the attack on the French Embassey in 2011, when Al-Quaeda stated that they wanted to kidnap tourists. There was already hardly any tourists at the Segou Festival (festival sur la Niger) compared with previous years, and the impact of this were already showing in terms of the lack of business for traders, many of whom had traveled far just to come and sell to tourists at the festival. I can only imagine what it’s like now. Hopefully events of the past week are the first steps on the path to a more stable future for Mali, because they are surely having a devastating impact on what is already one of the most financially poor countries in the world. Somehow this has now also begun to attack the incredible wealth of Mali’s music and culture too. Have you recently been to Mali, consider going or know someone there at the moment? What are your experiences there, and have you heard any more or different about the situation on the ground? Author JamesPosted on February 26, 2015 February 28, 2015 Categories African MusicLeave a comment on Ban on music in Mali, home of the djembe, the blues, the banjo and so much more! Biologists from the university of York, have been studying chimpanzee in the forest in Uganda. They have discovered that Male chimps use unique drum solos to communicate as the chimps are moving through the jungle. Just like djembe players, each chimp was shown to have it’s own trademark phrases that it repeats regularly, that are distinct from those of other chimps. The scientists were able to identify certain chimps by their phrases. The chimps do this by beating tree roots with their feet. The lead psychologist behind the trial, Dr Katie Slocombe, who ran this study believes that it may provide some insight into the evolution of rhythm in humans. It does show that rhythmical ability isn’t unique to humans, and could perhaps indicate some possible cause of the why drumming may have started with our presumed common ancestors. If you’re interested in reading more about these studies you can find more information here, and even deeper reading here. What’s your take on this? Does it provoke any interesting thoughts or opinions? I just wanted to let you know about and awesome, limited time offer that the Rhythm Reference doing. You can now pay what ever you want for their amazing djembe learning lessons. Don’t miss this amazing offer! PS – if you think this is as great as I do, then please let your friends know by email or Facebook.